Share the post "30 – 2nd St. NE"
I’m really hoping for a good turn-out of buyers tomorrow at my open house which will be at 422 S. Tennessee Place here in Mason City. If there ever was an under-the-radar great value condo listed in our City, this one fits the bill. I’m pretty confident it’s going to sell to a younger professional or semi-professional who’s looking for all of his/her preferred amenities in a home, but can’t afford it; thus opening up an opportunity to get those desired features in this condo. Since it’s an upper unit, the utilities on it are super low. One of the biggest features, is there being a washer/dryer room contained within. Who wants to share laundry with other owners like they do out at the Briarstone condos. Most don’t realize that those units were originally built as apartments, whereas the condo I’m having open tomorrow was never an apartment building. Now you understand more fully why this unit is a great buy. Stop by tomorrow and take a closer look. I was certainly brought up to speed regarding the limited hunting season and super low bag limits. Oh my gosh! It’s no wonder we’re seeing herds ranging from 8 to 10, to upwards of 50. People who feed them on a regular basis are just adding to the problems we’re now facing. Now just think about it, come Spring there’ll be all those pregnant females having fauns. Just do the math. We complain about all those dirty crows hanging about, but move over Mr. Crow, because our landscapes are going to be fully infested by deer. I would encourage our general public to write letters to our Govenor about getting on the DNR to extend the deer hunting season, as well as raising the allowed per person bag limit. I was also informed today that because our “city” deer have made their home here, there’s a great deal of in-breeding going on to where their off-spring are showing creepy physical signs. There’s no “freshening” of those city slicking herds. I’ve seen with my own eyes what a herd of deer can do to a large garden in one or two evenings. We’ve got to get our hunting laws changed, and very soon. 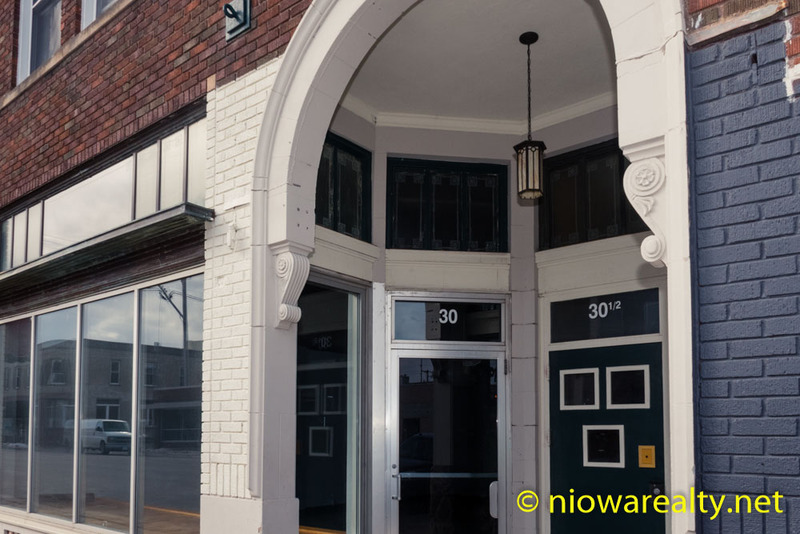 My new listing today is a commercial/retail building located in the heart of Mason City’s Historic Downtown. The above photo is but one of many I’ve posted online. The building was built during our City’s “golden age” prior to WWII, and believe me, it’s built like a brick shite haus. I can envision many businesses opening their doors at it’s location. In our Historic Downtown I want to see a bakery, a barber shop, a delicatessen, a men’s or women’s higher-end clothing boutique, an Italian restaurant, a take-away sandwich shop, an Indian or Tex/Mex restaurant, a bistro, and my list of specialty shops goes on and on. For many years prior, it was an attorney’s office, and before that an insurance office. To help with expenses there are 2 apartments upstairs that are currently rented. It’s got the best bones and now waiting for someone with vision and some clean bucks. It’s listed at $99,500.00 and located at 30 – 2nd St. NE, so don’t wait a day because it will get SOLD!